Mini quiche are perfect for a brunch menu or served as appetizer. They are pretty easy to put together, there is a ton of flexibility in the ingredients, and they can be served at room temperature. Make your own pie crust or use a store bought refrigerated dough and just roll it out. The key with the white cheddar spinach mini quiche is to find a good, extra sharp cheddar cheese. This is one time where you definitely don't want to use the pre-shredded bag cheese. Spend the extra couple bucks and get a good sharp white cheddar and grate it yourself. Preheat oven to 350 degrees. Roll out pie dough and cut rounds with a biscuit cutter or other circle shape. Press rounds into a non-stick mini muffin pan. Use a fork to poke a couple holes in the bottom of each crust. Bake about 7 minutes. Remove from oven and reduce heat to 325 degrees. Squeeze any excess water out of spinach and chop. Add a small amount to each crust. You will fill up each crust but don't worry the eggs will fill in around everything. Add a small amount of grated cheese to each crust. Beat eggs in a 2-cup measuring cup and add heavy cream. Add salt, pepper, cayenne, and chives and whisk to combine. Pour egg mixture over the spinach and cheese to almost the top of the crusts. Return to the oven and bake 18-20 minutes more until the eggs are set and the tops are golden brown. Cool for about 5 minutes and then remove from pan, using a knife to loosen the edges if necessary. These look super yummy. I love your photography. How do you set up your shoots? YES!!! This is exactly what I've been wanting to make lately, thank you so much for posting!!! 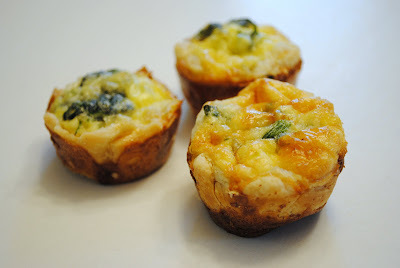 I've always wanted to try making mini quiche - they are so cute! They look great, I will have to send those with my husband for his next work potluck. And I do agree, shredding the cheese (a good cheese) makes all the difference! @Maestra Orquestra -- It's funny that you ask that because I'm experimenting a lot with it and just a beginner. I'm still trying to figure out how to maximize the features of my camera. I'm trying to use as much white as I can and have found that the pictures turn out much, much better when I have natural light. My friend has made these before and they are AWESOME! Thanks for posting the recipe...I'm going to try it soon. they are probably soooooooooo good!